I’m back from Chicago and an excellent WorldCon. I’d never really been to Chicago before (just its airport), so this was my first trip to the city, and I have to say: I was mightily impressed. What a city! I didn’t manage to see a Cubs game or get to the lake shore (construction), but I did get to enjoy some great food (as below) and saw some magnificent buildings, which was enough to whet my appetite. Rarely do I visit a city I would like to visit again. Chicago is an exception. One of the highlights of the trip was the parties with the Brotherhood Without Banners. The BWB is a fan group of George R. R. Martin’s (named after the group from A Song of Ice and Fire), and they throw a series of killer parties at every WorldCon. Both George R. R. Martin and his wife Parris attended (as usual), but this year we also got to meet Ron Donachie, who played Rodrik Cassel in Game of Thrones—and had one of the most brutal death scenes I can remember ever seeing. 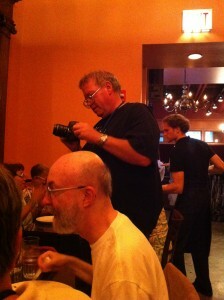 In addition, I got to meet (in some cases) and see again (in other cases) members of the Song of Ice and Fire Forum. (By the way, who made that beef jerky? It was outstanding!) Special shout out to the translator of the Polish edition of A Song of Ice and Fire Michał Jakuszewski, and also George R. R. Martin’s German agent Martin Fuchs and his daughter, with whom I had a nice discussion about books (and thanks to whom I’m now well into Jack Vance’s The Languages of Pao!). 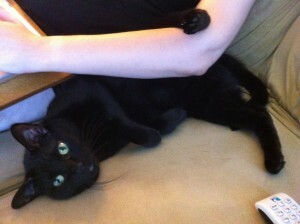 Okay, that’s actually a picture of my cat and my wife’s arm. Apparently Nina doesn’t like pictures, so I shall respect her wishes. But I actually got a really outstanding picture of her. This happened. Me nem nesa. Update: Whoops! I miscopied. The word for “tackle” is nokito, not noko. This is a crucial difference—not merely morphology! My bad! 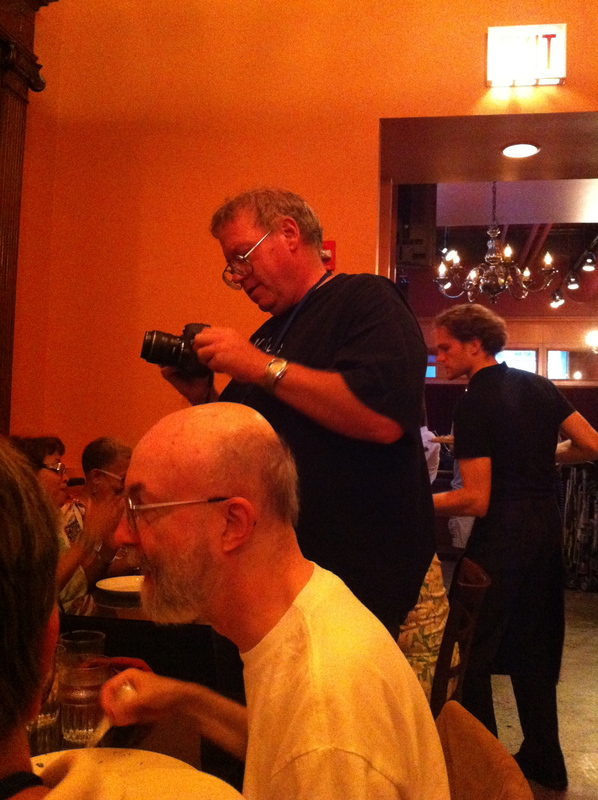 Posted on September 6, 2012, in Community, Vocabulary and tagged misc, technology, WorldCon. Bookmark the permalink. 8 Comments. Athdavrazar! David is right about Chicago. It is my favorite big city in the US, and this was my first extended visit in many years. 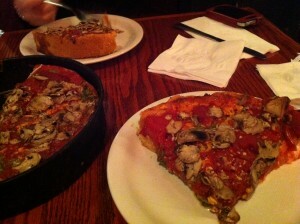 The pizza pictured is just one kind of Chicago style pizza, which is characterized by being VERY deep dish! There were quite a number of GoT and GRRM-related panels (And George R.R. Martin was out and about all through the event), but I didn’t get to any of them. I was busy with astronomy, spaceflight and linguistics panels. It sounds like next year, I need to do some more GoT activities! But there was still plenty of quality time to spend with the good folks from the Language Creation Society, and David. If you have never attended a major science fiction convention, this is something you should do. There is literally something for everyone, and more to do that you will ever get to get done! Ah, football terms! This ‘out-of-world’ vocabulary is one of the things that makes learning Dothraki fun! A lot of these terms are useful in general (in and out of world), as well as for football. (‘ball’, ‘game’, and ‘tackle’ easily come to mind.) And I am going to predict that (as a native Green Bayan, and a Packers season ticket holder and stockowner) that it will be the Packers again this year! Wow! I would’ve gone to that, too! Too bad it turned out to be a dud. And you’re a Packers’ season ticket holder?! You know that I’m a big fan, because of Aaron Rodgers, who was our quarterback for three years. (And by “our”, of course, I mean Berkeley’s.) I’d love to see him play live! Important: I miscopied the word for “tackle”. It’s actually nokito, not noko. Athdavrazar that you are also a Packers fan! You might find it interesting to know that there are more Packers fans than fans for any other professional football team! But more importantly, there is one word missing in your list– ‘Title’, because the Packers will win yet another NFL Title this year! Did you get to interact with GRRM at all? Yeah, he was at the party both nights. He was coming in as I was leaving the first night; talked to him a bit the second and introduced him to some friends. I also talked to him Friday, but what was going on…? Oh, right. I was in the green room, and I was desperately trying to get something to work (for Defiance); I was kind of frazzled. I was reading FFC at the time, and had him sign the book. So, yes I did interact– briefly.